Jack's has your replacement Briggs and Stratton Flywheel ready to go. We have flywheels and flywheel fans for your lawn mowers, snow blowers, and many other types of equipment with a Briggs and Stratton engine. Match your model or part number below to get a replacement flywheel or fan. 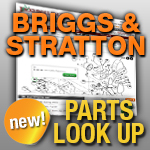 We also carry Briggs and Stratton flywheel keys.